Whilst we wait for democracy to do its thing, lets talk about skills. Yes this horror game is also an RPG although there isn't much you can do to differentiate one play through from another. Brad here shall serve as a demonstration. The first thing you might notice is that we have two experience pools to draw from. The Attribute Points pool and the Skill & Spell points pool. This is only the case for character creation, once we get into the game proper we will only have a single experience bar. Attribute points can be spent on any of the five Primary skills. The Primary skills being: Strength, Knowledge, Dexterity, Stamina and Willpower. The Strength skill supposedly increases melee effectiveness as well as providing a small bonus to your overall hit points. The Secondary skills that it governs are by far the most useless and can pretty much be ignored entirely. The Knowledge skill on it's own does absolutely nothing. It's merely there to boost the effectiveness of it's own Secondary skills. This isn't a bad thing at all as all four are quite useful, especially at the start of the game. Dexterity, as far as I know, also has no real inherent value. Half of its secondary skills are well worth investing in however. Increasing Stamina will provide a bonus to hit points and supposedly provides poison resistance as well. Not strictly necessary but the extra health is always welcome. Finally, Willpower will increase the amount of magical energy you have, presumably it also provides a small measure of magical resistance. If increased to a certain degree during character creation, it will unlock as many as two spells. 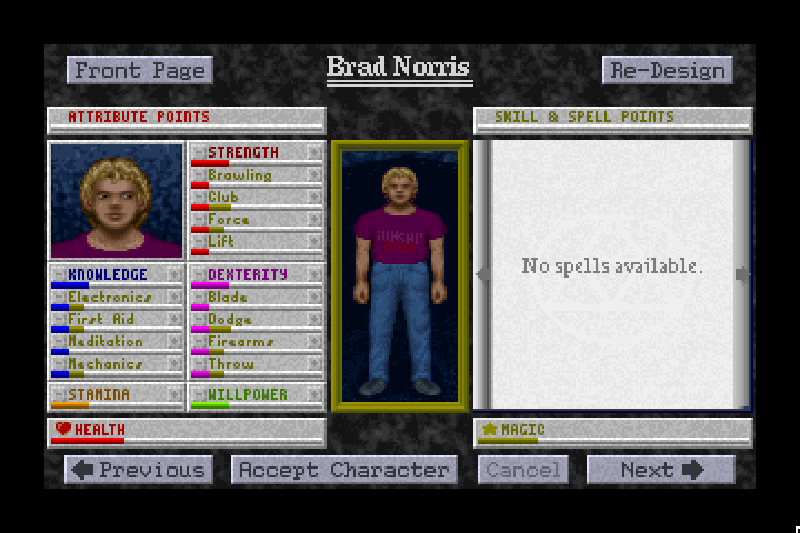 I generally increase it to just below this level, as I prefer to collect spells as we progress through the game. While the skill is not important at the start of the game, it will become absolutely critical at certain points and should never be neglected. Increasing any of the three Primary skills that have secondary skills under them will net a small bonus to those skills. The Skill & Spell points pool can only be spent directly on Secondary skills or on increasing the effectiveness of spells, assuming you have any spells to spend them on. Brawling increases your skill in unarmed combat. Why on earth are you trying to take on the forces of darkness with your bare hands? Almost anything you can pick up can be used as a weapon so its not like they're in short supply. Ignore this skill. Club increases the effectiveness of blunt weapons. I personally don't bother with this skill. Blunt weapons are very common to begin with but you'll never find a powerful one anywhere. Force this skill lets you ram certain locked doors open. Problem is, it can hurt you and there isn't a door in the game that can't be opened by other means. Don't bother. Lift According to the manual, this skill lets you pick up heavy objects... There is no object in this game that cannot automatically be picked up. This skill does absolutely nothing. Blade is a very good skill. They're fast, have a short recovery time, are high damaging and all the best melee weapons are blades. The only real downside is that they're kind of rare. I highly recommend this skill. Dodge supposedly makes it harder for ranged attacks to hit you. Its main strength is letting you duck by enemies, which while not strictly necessary, has its advantages. Worth considering. Firearms are a nuisance. Ammunition is limited, there's no guarantee you'll hit anything and they have a tendency to jam at low levels. That being said, they're not entirely useless and it can make one part of the game far less of a headache. Plus you get a decent selection too. A few points in firearms can be handy. Throw You don't need to throw that often and when you do it'll generally hit anyway, so don't bother wasting points on this skill. Electronics this is skill lets you deal with various electronic objects. It's well worth investing in. First Aid A very handy skill. Increases the chance of successfully to healing yourself. With medical supplies being finite in this game, that's a good thing. Meditation Same thing as First Aid, but with magic. Oh so useful, even more so than First Aid as there are healing spells. Mechanics is essentially this games lock pick skill. It's about as useful as Electronics, but less electrical equipment is involved. It can also be used to unjam firearms.